It’s possible to set up Folder Guard to stop downloads of programs with any web browser, including Internet Explorer, Firefox, Chrome, Opera, Safari, and so on. Suppose you don’t want users to download programs from the Internet, yet you would rather not to block the Internet access completely and allow the users to to browse the web sites, use email, etc. For such a goal, you could set up Folder Guard to restrict Internet Explorer from downloading the programs from the Internet. 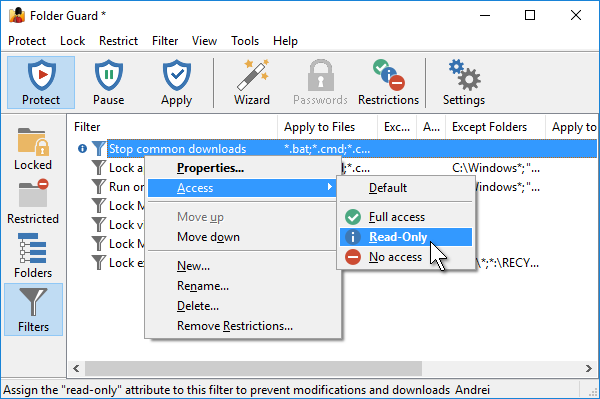 Folder Guard lets you create the file access filters. You could create a filter that would apply to any executable file or a script, but skip other files. You would assign the Read-only attribute to such a filter, and that would stop any attempt to create a new executable file (and thus prevent downloading them! 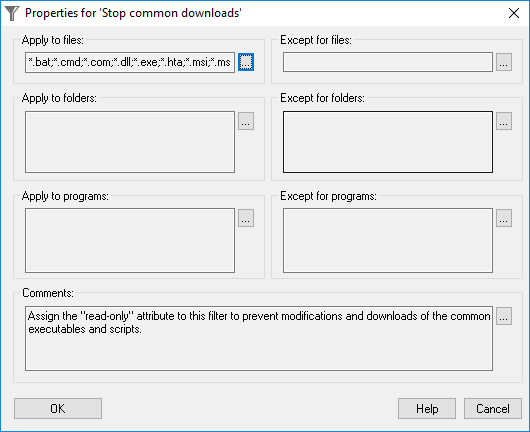 ), while allow the use of the existing programs. Your may need to make some modifications to this list: for example, if your users are supposed to be able to modify the BAT scripts, remove the *.bat mask from the list. The above entries ensure that Windows Update has an unrestricted access to all files and folders of your computer. Without them, the filter we’ve created would prevent Windows Update from installing the updates. Other web browsers could give similar messages, or they could just sit there forever expecting the download to start. The end result is, the users cannot download programs anymore while they still can use the existing programs! 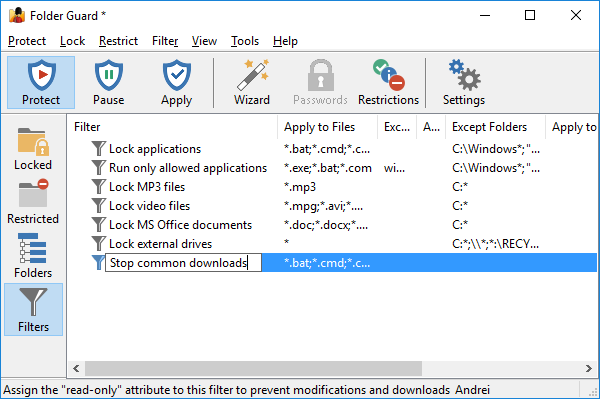 One side effect of the protection we’ve just set up is that the filter will not only prevent downloading the programs, but it will also prevent installing or copying programs from/to the CD or removable drives. It may be a good thing, or not, depending on your specific requirements. If you want the users to be able to run programs from the removable drives while the Stop downloading filter is in effect, you need to create another filter that would specifically allow full access to the executable files located on the removable drives.